Listening to this parable today prompts us to consider Saint Josemaría's persevering prayer here where he so often begged God for light to see the path he knew he was called to, without yet knowing its specific form. 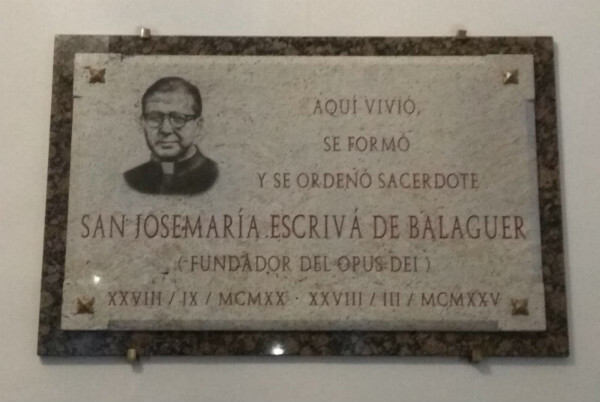 In the rectory of San Carlos, a commemorative plaque states that Saint Josemaría "lived, was formed and was ordained a priest here." Our gratitude goes out to Fr. Carlos Palomero for having put up this plaque that gives us great joy. 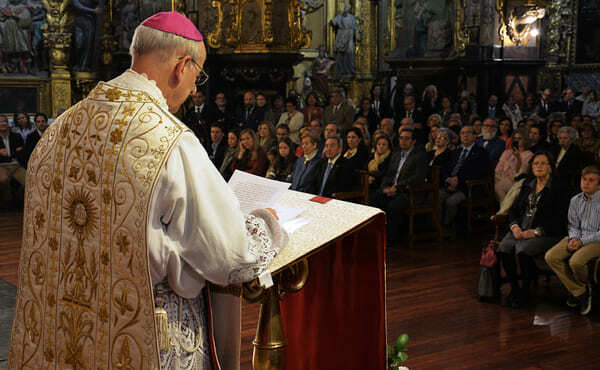 In 1960, when Saint Josemaria received an honorary doctorate from the University of Saragossa, he made reference to the "unforgettable memories of times long ago: the years spent in the shadow of the San Carlos Seminary, on my path to priesthood." Doubtless those memories would have included the first time he gave Holy Communion to his mother in this church, as a deacon. How is our prayer going? "Two men went up to the Temple to pray ..." The Pharisee thanks God; he recognizes that his qualities and good deeds would not be possible without God’s help. It is very good to give thanks. However, this man was really praising himself and, above all, despising others while lacking something very necessary: acknowledging his need for mercy and forgiveness. In contrast, the publican simply confesses that he is a sinner and in need of God's mercy, and he is forgiven. We can briefly consider two elements of our relationship with God: gratitude and asking for forgiveness. Both aspects are based on faith, especially faith in God’s love for each and every one of us. Saint John offers a wonderful summary when he describes the Apostles’ experience alongside Jesus: "We have come to know and to believe in the love God has for us" (1 Jn 4:16). As Pope Francis writes, "Faith also means believing in God, believing that he truly loves us, that he is alive, that he is mysteriously capable of intervening, that he does not abandon us and that he brings good out of evil by his power and his infinite creativity" (Evangelii gaudium, 278). We have so many reasons to thank God and to ask Him for forgiveness! With faith in his love, we can trustingly ask for help as well, because we always need it. 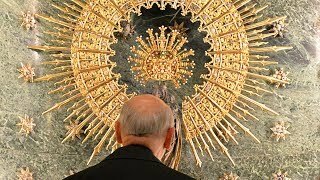 The prayer addressed to God by Blessed Alvaro del Portillo, who so faithfully followed the founder of Opus Dei's teachings, sums all this up: "Thank you, forgive me, help me more." Together with prayer, we need the Eucharist. Today, on the anniversary of Saint Josemaría's first Mass, I cannot help but remember how he always insisted to his daughters and sons in Opus Dei on the need to be "souls of the Eucharist, souls of prayer." And also his teaching, embodied in his own life, on the Holy Mass as the "center and root" of the spiritual life. In Saint Josemaría’s first Mass, together with joy and gratitude, our Lord also wanted the Holy Cross to be present in the form of painful family circumstances. When suffering enters our lives in one way or another, let us turn our gaze to the Cross of Jesus: let us go to Him in the Eucharist. And our suffering, united to our Lord's sacrifice, will be transformed into spiritual strength and a source of joy. We are celebrating the Eucharist. In a few minutes, Christ's sacrifice will be present on the altar. Let us renew our gratitude to our Lord, who has wanted to give Himself to us as food for eternal life in Holy Communion. As Saint Leo the Great taught many centuries ago: "Sharing in the Body and Blood of Christ transforms us into what we receive" (Sermon 12 on the Lord’s Passion). It is above all through this that one truly becomes ipse Christus, Christ Himself, which Saint Josemaría so often spoke and wrote about. Becoming Christ Himself because, as our Lord tells us: "Whoever eats my flesh and drinks my blood, remains in me and I in him" (Jn 6: 56). Thus we can see and react to people, circumstances, the positive and the negative of this world and our own life, as Jesus sees and reacts. And therefore, we can think and act with real concern, affection and service to others. When he finishes explaining the parable of the two men who went up to the Temple to pray, Jesus concludes: "Everyone who exalts himself will be humbled, and whoever humbles himself will be exalted." God does not rejoice in our humiliation. He wants us to be humble in order to exalt us, so that – by emptying ourselves of disordered self-love – we can open up space in our life for the action of his grace and love. Humiliation, like everything in Christian life, also refers to the Eucharist, and therefore to the Cross. Prayer, Eucharist, Cross, humility. With the joy of the children of God and, as always, with the maternal mediation of Holy Mary, Our Lady of the Pillar, before whose image Saint Josemaría celebrated his first Mass. Until 1951, this was the site of the San Francisco de Paula seminary, where Saint Josemaria prepared for the priesthood and was ordained.